I've tried to convince him that I'm a ninja, but he ain't buyin' it. was in middle school....For 2 1/2 years it was some good Daddy/Daughter Time. After that period we were ready to test for black belt. That had been the goal. No quittin' til we each earned one..
We ran through our forms and self defense techniques flawlessly. We broke boards with our hands and feet. We even broke a 2" slab of cinder block. But that was just the warm up. The final test was sparring. Master Lee called out Nathan to be my first opponent. Nathan was 7 years old. join in the attack. Soon there was a kicking and punching swarm of them. of only one thing to save myself. I picked up Nathan and used him as a human shield. I got some laughs. I got some funny looks. And I got my black belt. Jessica did too. Well, they weren't first degree black belts. That would require another 6 months of intense training and study. We wanted black belts and these were black belts. 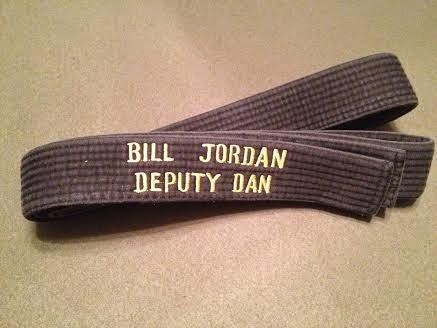 My official rank is "Deputy Black Belt".